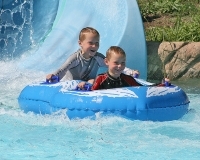 A must for all families on vacation in Kos, especially with young children, Lido Waterpark provides wonderful games, activities, sun, fun and more. It is one of the largest waterparks in Greece and features numerous slides (including Kamikaze, Multi lane and Black Hole), pools (including a wave pool), jacuzzis, hydromassage facilities, tubing courses and even a fish spa where the little critters will massage and clean your feet. For those who prefer land activities there is sunbathing, beach volleyball and even trampolines for amusement. There's a special area for young kids too little to enjoy the slides, where there is a kind of waterworld playground and shallow pools. There is also a bar and multiple restaurants for food, drinks and snacks and even a mini-market for shopping. The park is clean and safe, with the water recycled and renewed on a daily basis and a team of qualified lifeguards permanently on duty. Remember to pack the sunscreen because the summer heat and all the water can mean serious sun exposure.